If you’re looking to find accessible office space Toronto, especially in or near the downtown core, there are plenty of parking facilities available. But how expensive are they in the long run? And how much will they add to that supposed inexpensive Toronto office for rent you’re considering? 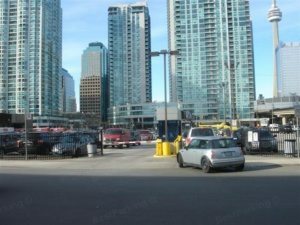 What you save monthly in your downtown Toronto office space rental may be offset by expensive parking at your office for rent Toronto! In a recent article in Metro News, the 11th Annual Colliers Parking Rate Survey (that examines costs in 61 cities across the continent and 12 in Canada) found that drivers for downtown parking at your office for rent Toronto pay an average of $332.38 a month, $23 a day and $9 an hour! That’s very costly – and could reduce any savings you might find renting the best Toronto executive suites or the most prestigious office space Toronto buildings. If you’re talking event venues Toronto, then you may pay even more for parking unless there is daily competition at or near the event site. That figure of $332.38 a month is the second highest in the entire country behind Calgary, Alberta! Competitively-priced parking in a prime office rental Toronto location should include easy access to major arteries, a choice of above-ground or underground parking, be close to your workplace, and most importantly, have reasonable rates. Some buildings may even offer substantial discounts for parking at your office for rent Toronto by signing yearly parking contracts, or may include parking provisions as part of their Toronto office space for lease arrangements. Easy Toronto office space parking at almost 50% less! For many business tenants, ease of access is just as important as cost. For example, just try to cope with the traffic congestion you’ll find on any given day along King Street when searching for accessible Toronto office space in the downtown area. And if you decide to make a turn on King Street during rush hour – well, good luck with that, you’ll definitely need it. Telsec Business Centres is a prime office space Toronto location with plenty of nearby parking at your office for rent Toronto. Located parallel to Yonge Street there is above-ground parking on Freeland Street, that offers inexpensive rates at your office for rent Toronto. As well, under the Toronto Star Building, there is convenient underground parking facilities. The average price between the two is about $170 per month. That’s almost HALF of the average for downtown parking cited in the Colliers survey.